March | 2010 | Promotional Incentives, Inc.
As a provider of promotional branded products, I marvel at opportunities where companies capitalize on the use of these branded products with additional exposure through live television coverage and photography. Those of use who’ve been educated in marketing, sales and advertising know the four P’s of the marketing pie (product, price, place, promotion). This blog is about the brilliant, timely implementation of these core essential marketing premises. Case in point amidst March Madness®, Glaceau VitaminWater’s brand exposure on weeks of coverage of the NCAA® basketball tournament. You cannot watch five minutes of any game in the playoffs without seeing products branded with the VitaminWater logo in the background. They are located in the premium position behind the team benches. When I Googled NCAA® Basketball Championship sponsors initially, VitaminWater was not even listed. After watching the tournament intermittently over the past two weeks, I finally saw a commercial for their product during the Elite Eight®. Though not listed is a top sponsor of the tournament, VitaminWater does have a Facebook page complete with a link to NCAA coverage where fans can vote and show support for their teams and submit personal stories of surviving March Madness®. It is unlikely they paid the sums equivalent to that of primary sponsors, and yet their exposure to the international audience was incredible combing the power of social media with television coverage. In my opinion this is promotional marketing brilliance. By providing this targeted and highly applicable product to the teams in customized containers (I’m not even sure if the beverage in those containers is in fact Glaceau’s product), VitaminWater has maximized their promotional dollar to an enviable degree. I dig living examples like this one and look forward to the NCAA Championship finals next Monday! Lucy Costa, Pres. Promotional Incentives, Inc. This week I had the fortune of experiencing two vastly contrasting events, both with hope-inspired, uplifting messages from experienced Americans. The first event was the monthly luncheon of the Lee Building Industry Association (BIA) held at Pelican Preserve Country Club. Thanks to the sponsorship of Wayne Wiles Floor Covering, the guest speaker was former Notre Dame head football coach Gerry Faust. The spacious dining room was filled with mostly men (I counted ten women including three staff members) who were enthralled with the stories shared by Coach Faust. The fare was fitting: beef stroganoff and pecan pie. Oh, and there was a salad too. Mr. Faust encouraged the interested audience in pursuing their dreams as he had, even if they all may not come true. He humbly shared that his first dream was to play for Notre Dame, which did not manifest itself. His second dream was to become the head coach at the famed Catholic University, which was realized and the rest, as ‘they’ say, was history. Coach Faust emphatically proclaimed if you love what you do, do it from the heart, and your (company, organization, et.al) is good at what it does, there is no stopping you and your will find a fulfilling career. Unfortunately I had to leave the lunch early to go across town to the Lee Pace Center for Girls Grand Dames Tea at Broadway Palm Dinner Theatre. I was late but was escorted to my seat nonetheless by lovely Pace volunteers. A broad smile consumed my face as I absorbed the contrasting scene. The theater was filled with women donning dresses and stylish hats, the tables adorned with spring colored napkins, flowers and tea cups, and the fare was finger sandwiches, scones and cupcakes. Out of the nearly three hundred attendees, I counted three men and a baby who could have been a boy. The three women honored (Dr. Veronica Shoemaker, Helen Johnson Hendry and Jeanne Bouchette) looked positively regal sitting in their pastel-colored fan-back chairs provided by Robb & Stucky. But the air was not of aristocracy, but humility and quiet accomplishment. Each woman shared her insights to living a fulfilling, active, charitable life (they all still work entering their eighth decade) and each exuded poise, grace and a twinkle in their eyes. At the end of the day I reflected on the amazing wisdom imparted in two contrasting arenas by distinguished members of our senior community. Each message was incredibly applicable, inspiring and they all encouraged everyone in both rooms to pursue their dreams with passion and energy. I felt blessed to receive these inspirational messages and my thanks to both organizations for the opportunity to grow and have my passions inspired. The ambience at Brew Babies, secret gem in downtown Cape Coral, was lively and fun. Palm trees and mint leaves, dapper straw hats and high heels gave the night an additional sparkle. Fire pit heaters warmed the courtyard as the conversation and conviviality heated up. The mojitos flowed to the sounds of the outstanding live Cuban music provided by a five-piece Latin rhythm band. The food was delicious and service attentive by owner Valerie Elam and her team at Brew Babies which made the night even more enjoyable. An outdoor screen provided by Inflatable Cinemas displayed the winning entries followed by a live presentation of the industry’s top awards. This year’s ADDY committee set out to establish a new award, an “Oscar” if you will, that would be completely unique to the AAF-SWFL Addy Awards. 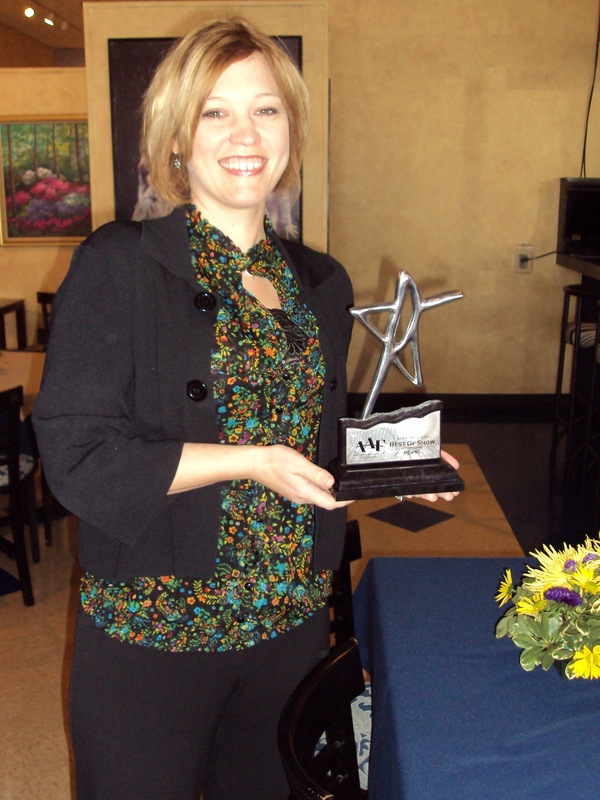 With the assistance of Promotional Incentives, the team perused numerous options and finally narrowed the field down to a magnificent metal and fossil stone Star Award – one that exuded the level of achievement being recognized by the award. Wendy proudly displays her ADDY Awards! 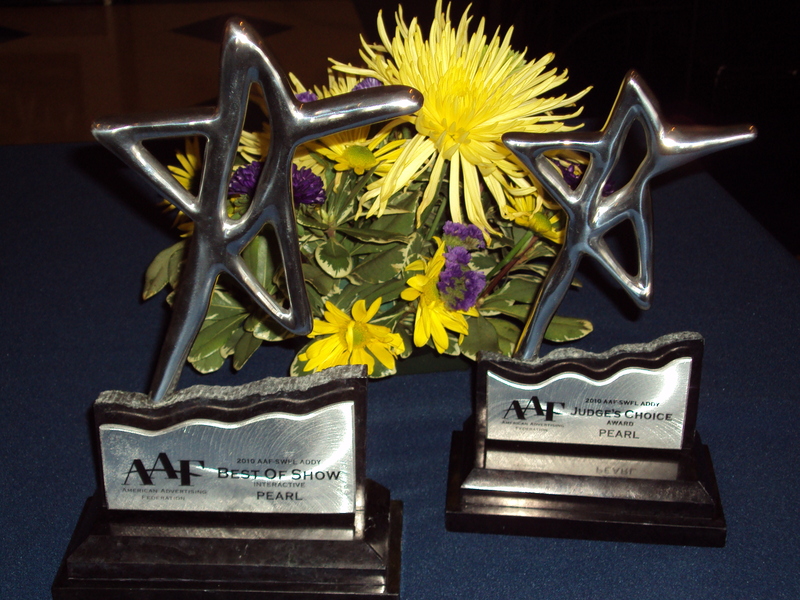 This award was chosen because the “Star” was nearly identical to the AAF logo/icon and would make the award fitting to the organization’s top levels of achievement. As an added personalized touch and to distinguish between the silver and gold level, some of the awards were further customized with the star and etched plate in gold metal honoring the best of the best. One of the ultimate goals in promotional marketing is to be able to give away a product that exudes or conveys the company name and/or marketing message. Kiss Your Web, LLC, a Fort Myers-based web design & social media firm, is being introduced to Lee County with a strong marketing presence and prowess. “Keeping Internet Solutions Simple” is the company’s motto and, hence, the reason for the K.I.S.S. name. When a KISS is More than Just a Kiss! Owner Dr. Sandi Eveleth, the “DigiDoc” in the social media world, hit the ground running with her new business. Kiss Your Web has its own online merchandise store and earlier this month hosted a Grand Opening at their location on Presidential Court, Fort Myers, FL. Promoted almost exclusively via Facebook and Twitter, Sandi proved the effectiveness of Internet marketing. Within two weeks, she had received 100 reservations for her event. Although the weather delayed the start, the rains passed and the festivities resumed, including dance music and a video shown on a 25-foot inflatable cinema provided by InflatableCinemas.com. 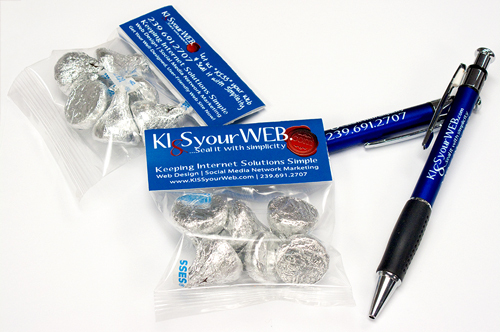 Sandi gave away trendy click pens imprinted with the Kiss Your Web contact info and the catchiest gift, a one oz. package of Hershey’s® Chocolate Kisses™ sealed with a custom imprinted card.